Even the best-known composer in his lifetime may fall into obscurity after death. Belgian composer François-Joseph Gossec was acknowledged to be the greatest instrumental composer at the close of the ancien régime in France (Marie Antoinette loved his music) and, after an amazing about-face, he was also acknowledged to be the greatest composer of the Revolutionary and Napoleonic periods (Robespierre loved his music). But all his fame has faded from memory, and Gossec is instead remembered for having composed the “Tambourin” for Flute and Orchestra. 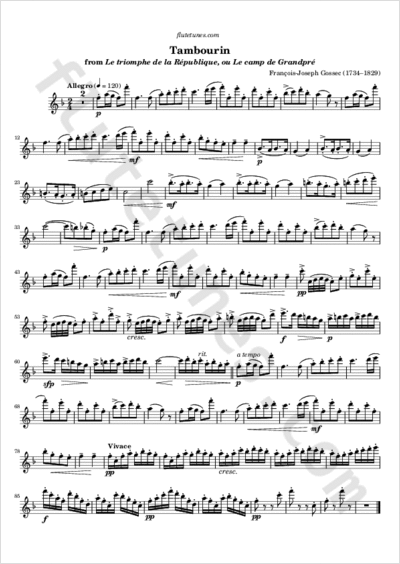 Taken from his divertissement-lyrique (a genre similar to opera) Le triomphe de la République, ou Le camp de Grandpré, this delightfully bright and lively piece is nearly mandatory among flutists: James Galway and Jean-Pierre Rampal have performed and recorded it numerous times.